This entry was posted in skin on January 13, 2019 by admin. This entry was posted in Uncategorized on January 13, 2019 by admin. This entry was posted in skin, Uncategorized on January 13, 2019 by admin. Bulging discs in your lower spine can press on the nerves that supply your feet, causing you to feel pain in your heels. A previous back injury or wear and tear arthritis or bone spurs in the lower back. It is more common in the 40-60 age group, golfers and dancers. Avoid activities or movements which cause the pain. A Pain clinic may help with epidural injections. Surgery may be required to attend to the spinal problem. Pain relief medication should give fast relief. Exercises and postural correction may take some weeks to improve. Inflammation, heel pain and bone spurs are found in patients with Reactive Arthritis. Reactive Arthritis is caused by an infection which may also affect the eyes and urinary tract. Your doctor may order blood tests and prescribe antibiotics, anti-inflammatories and immunosuppressants. Your podiatrist will help with footwear advice and modification, insoles and orthotics to reduce load on the painful areas. Managing the symptoms may provide fast relief, but treatment may take weeks to eradicate the infection and settle inflammation. 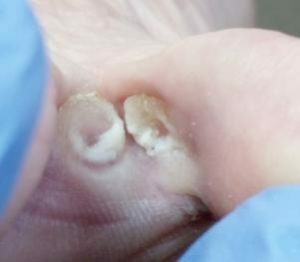 Heel pain is often associated with Chron’s Disease and Ulcerative Colitis. There is a higher incidence of inflammation in the heel where the achilles tendon and the plantar fascia attach. Scans may identify inflammatory hot spots. A Podiatrist will provide splinting or immobilisation, orthotics, footwear advice and strengthening exercises. Your doctor may advise blood tests and medication, and possibly referral to a rheumatologist. Managing the symptoms may provide fast relief, but treatment will be long term and involve appropriate footwear and support to reduce load on the painful areas.